Prompt delivery. Lovely watch. Very pleased with value and quality! Gorgeous looking! Would def order from watch shop again. Very nice watch. Looks nice and comes in a very nice looking gift box, ideal for me because I was giving it as a gift. Identical replacement for previous watch now damaged purchased from Watchshop. 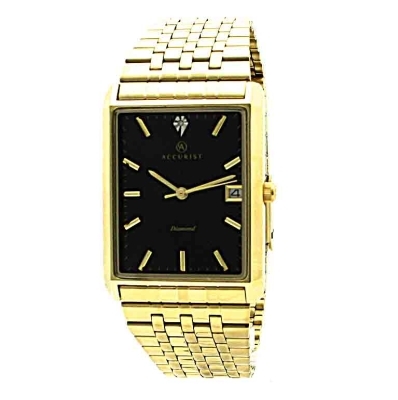 A very elegant watch at a bargain price easily ordered on line and supplied with the usual efficient service. A very nice watch for an excellent price, I am very pleased with the purchase. This was excellent value for money, to which my stepson was extremely grateful. The watch is absolutely fantastic! Lightweight, simple and classy but at the same time posh! What I dont like is the crown which is very small and flaky I havr the feeling that when I adjust the time it will brake any moment! I got it with a luxury gift wrap which was very nice as well! Watch looks a lot better in person than in picture easy to adjust fab for its price !!! This watch is beautiful it is light and elegant, it looks better than the picture and my husband loves it. Excellent watch received in good time. Very pleased. Good looking and quality watch. Recipient was very happy with it. A really nice looking watch.Very easy to see the time,excellent colour and looks. I bought this Accurist Diamond watch for myself and I am chuffed to bits with it. The strap is very easy to adjust to fit any sized wrist, so there is no need to submit any measurements before purchase. The beautiful black face is very distinctive and allows you to read the time easily. The date viewer is also easy to read. The 25mm by 30mm watch face is a suitable size for any width wrist. i find this watch excellent in design all i wanted in a watch, excellent value for the money too. nice face and thin profile so sits on wrist easily and doesnt ruffle the shirt cuff BUT wrist strap is fragile - found it only just fits an 8 inch wrist - requires the clasp to be altered which isnt easy and then the clip doesnt feel secure but after putting on found it very difficult to undo the clasp - should be ear-marked as a dress watch since one doesnt gain the feeling that the strap is robust enough for day-to-day wear. Not my first purchase from you. Wouldnt go anywhere else. Christmas present for husband - who LOVES watches!! Speedy delivery and beautiful watch. Lovely watch at a great price. Very smart and exactly what I required. Lovely movement and style. I would recommend this item to anybody. bought this item to wear to a wedding and certainly compliments the new attire.